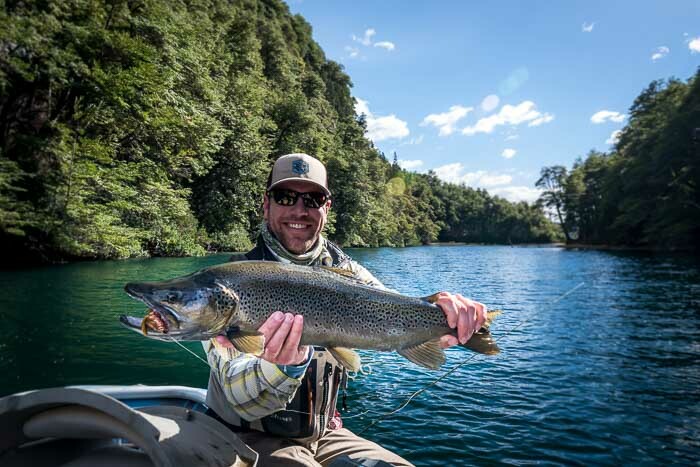 After a stellar week at Magic Water’s Lodge in Chile, Rick and I traveled north and west into Argentina to join Pancho Panzer at the Carrileufu River Lodge. 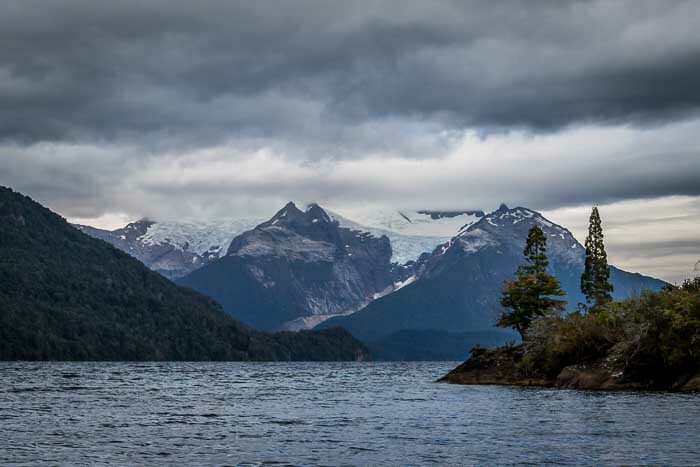 Located near Cholila, Argentina and just outside the spectacular Los Alerces National Park. The travel day involved a long but very scenic drive through several different micro climates along rivers and lakes, fjords, mountain passes, and semi-arid landscapes with a quick and easy border crossing. Where Aldo met us for the final leg to the lodge. Upon arrival at the lodge, which is surrounded by towering peaks in the distance and overlooking the Carrileufu Valley, our good friend Noah was waiting with drinks in hand for us. 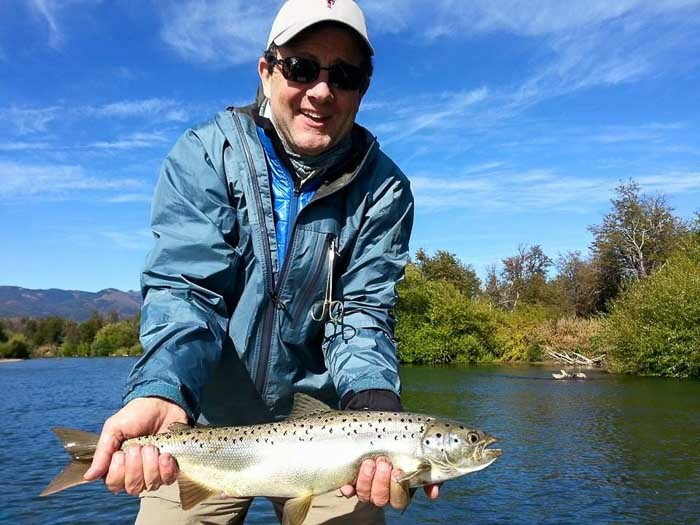 He had flown into Esquel earlier in the day and had already had some time to chat with a few of the current anglers staying at the lodge about big fish, great food, and amazing scenery. As we sat enjoying fine red wine and a mouthwatering meal our excitement was at a high. We couldn't wait for the next morning to come. We made the short drive to meet our guide for the day, Marcelo. He lives just one the shores of the lake and his family has for over a hundred years. He greeted us with a smile and prepped us on the rules of the day. This lake is special and would need to be treated accordingly. Now by default I am not a Stillwater fishermen. I like moving water with structure, banks and seams to fish to. So the plan to fish a large lake didn’t exactly peak my interest that morning. But after Marcelo telling us a little about the day ahead and some local history we began motoring up the lake and my interest level changed drastically. This lake is huge with arms shooting off in a number of directions as far as you can see. Gigantic glaciers hung to mountain tops that disappeared into the clouds. 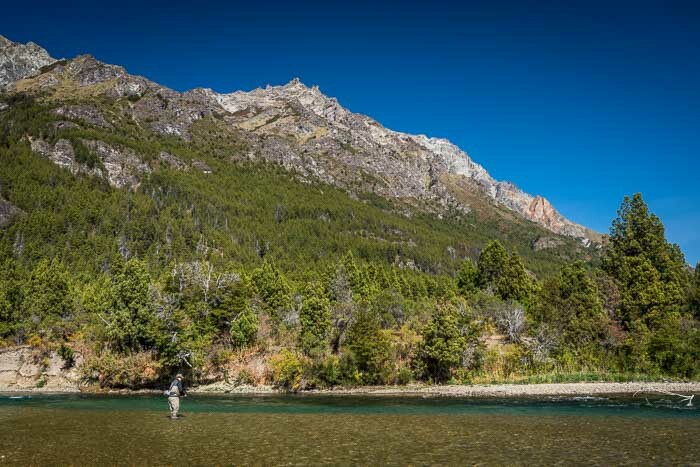 The water clarity when fly fishing Argentina was like nothing I had ever witnessed in all of my years fishing in the Rocky Mountains, British Columbia, or New Zealand. I had not made a cast or even seen a fish yet but this was going to be the coolest day of lake fishing I had ever had. We continued up the lake and into an arm that was just as big as the main lake, we had been motoring for 20 or 30 minutes without having seen a single boat or other person. We were the ONLY humans on this huge lake, period. After another 10-15 minutes we finally reached the end of the lake. Marcelo cut the motor and grabbed the fishing gear, “dry or sinking line?” he asked, but before we could answer he started rigging the sinking line, “Sinking. Bigger fish.” He said with a smile. We rigged 2 rods with sinking line and streamers tied by Marcelo and one with a dry fly. We started to work along the bank under the power of a small trolling motor when Marcelo loudly exclaimed “FISH, FISH, FISH!” He was standing in the bottom of the boat pointing at where the fish was. I was standing on the casting deck and had yet to spot the fish. We slowly drifted closer towards where he was pointing and I finally spotted the fish. Noah was on the back casting deck with the dry ready. The fish was cruising just under the surface scanning for food when Noah’s cast dropped down 3-4 feet from him. The fish immediately turned, quickly swam over and confidently gulped it down. Fish on! A feisty fat 19” rainbow, which ended up being the smallest fish of the day. That was an easy start to the day and it never changed. Marcelo worked the little trolling motor along the bank, as if we were floating a river, spotting fish long before any of us did. We continued to catch fish cruising the surface on the dry until the clouds settled in and the rain began to fall. This is when the sinking lines started to really produce. Casting at the bank letting the line and fly sink and stripping it back was no less than complete joy for me in the water. The water was so clear you could see everything, literally. So many boulders and ancient trees lined the banks creating cover of every shape and size in the water and overhanging the water. The water was so clear that 10 feet looked like it was only 3 feet deep and 30 feet looked like 10 feet. We saw fish everywhere. Watching a 22” fish come from 30 feet away to eat your fly with reckless abandon is not something I scoff at. This was a dream come true. I’m not even sure I could have dreamed this because it was so extraordinary and unlike anything I had ever experienced or though existed. I was having as much fun watching Rick, Noah or Marcelo fish as was having while I fished. I couldn't stop watching. I have no idea how many fish chased our flies or even how many fish we hooked, it was a blur of streamers dancing through gin clear water and flashes of aggressive trout smashing into them. It was only interrupted by the need to net the “bigger than average” fish and when I say “bigger than average” I mean over 22”. Again I don’t know how many “bigger than average” fish we caught but it was a lot. However I do know that by the time Marcelo told us to reel up for the day, which seemed way to soon, we had caught 2 “large” fish (One 27” and one 28”) and hooked another that came unbuttoned. 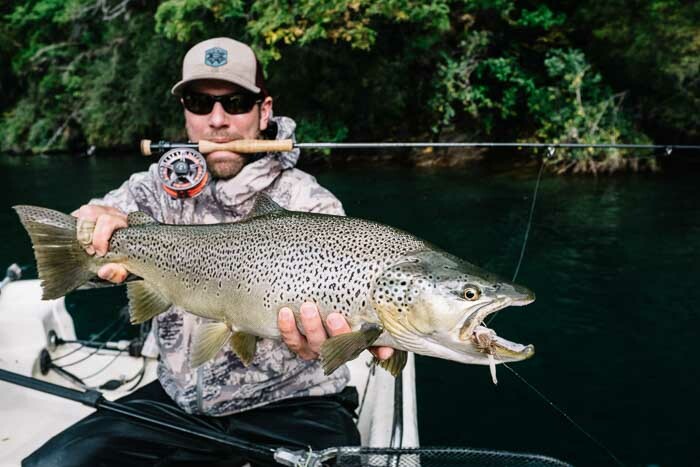 Battling a trophy brown trout. As we motored back towards the ramp through the rain my cheeks hurt from the large grin that had been and continued to be stuck to my face. This was the single most amazing day of lake fishing ever. I vowed that if still water fishing was like this everywhere I would never fish a river again, but that what made this so special. Still water fishing wasn’t like this anywhere else. If it is please let me know, I want to go. On the drive back to the lodge it was quickly and easily decided that we would be joining Marcelo for another day of lake fishing before the week was done. We set off down the outlet into the Rio Rivadavia. Pancho rowed me down the opening stretch while telling tales of the previous year’s bamboo bloom and how the mouse population exploded. Thus causing the fish to get exceptionally large. He would occasionally slow the boat for me to cast at specific structure or sub surface shelves. Along the bank was a small dead tree angling into the river creating a small bit of structure. Pancho pointed as I made the cast. I was fishing a heavily weighted streamer and sinking line. Once the fly splashed down I let it sink. Before I made my first strip the fly dropped out of sight and I felt a small tug on the line. I gave it a hard strip strike causing the line to come tight. It was solid but on the move. 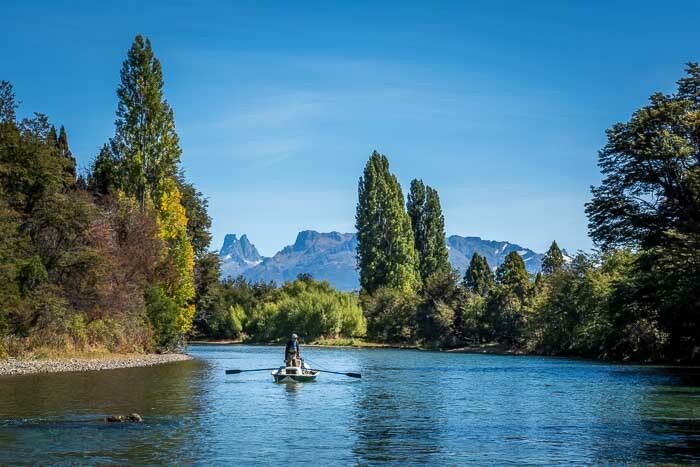 The Rio Rivadavia is one of Argentina's most beautiful rivers! Fish on! I continued to put the full strength of my six weight into the fish and was stripping hard. I could tell it was a good fish from the head shake. It only took me a maybe a minute to a minute and a half to get the fish to the boat and Pancho scooped him up in the net. Pancho left the net in the water as to not harm the fish but we had a problem. Only about 2/3rds of the fish was actually in the net! A huge brown lay patiently and quietly in the net unsure what had just happened to him. I quickly reached for my tape measure, 28” inches! I pulled him from the water for a quick photo and marveled at his size and beauty. After a few swift tail kicks he was gone. Pancho and I high fived. What a start to the day, a few casts in and the largest river Brown trout of my life! 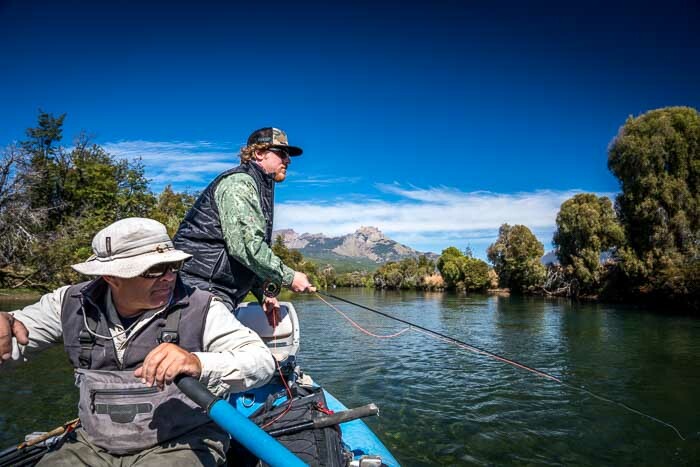 We continued meandering our way down the river fishing some of the most beautiful water I have ever fished. (This is a common theme to the whole trip is seems) Clear water, and amazing structure everywhere you looked. Every cast seemed to land in a juicier spot than the last. Our day continued with seeing an amazing number of fish from big too small. The fishing proved fairly technical but we managed some very nice fish by the end of the day and 2 other very large fish hooked but not landed. We were even joined by a local red fox for lunch to entertain us as we sat enjoying our meal and red wine. This would be a stretch of river we would need to visit again, that is for sure. From the lodge we drove about 5 minutes and had the boats in the water ready to float. Now that’s service. The Carrileufu is a mid-sized river that is fairly slow moving but with plenty of structure. Noah and I were fishing with Juancho for the day. We spent the most of the morning throwing streamers at the banks and through the deep runs which produced a number of modest sized browns and rainbows. On occasion we would see a rising fish to throw to with mixed results. 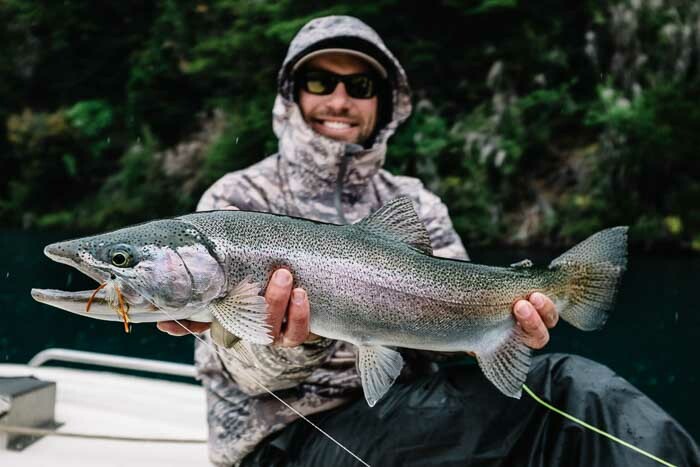 The fishing wasn’t exactly easy today but by lunch we had managed plenty of nice sized trout and Rick even got a sizable landlocked salmon, which was a highlight. After lunch and a nice siesta I was able to talk Juancho into taking his boat with Noah and Rick so we could all fish together. Juancho, Pancho, and Aldo were then able to all fish together in the other boat. As I wandered my way down river through a few small side channels we continued to throw streamers with mixed results. By late afternoon we started to see a few risers much to the pleasure of Noah. We started to get enough takes on the dry that drifting them blindly along the edges produced a few nice fish. As Noah drifted his dry past a bush a large nose poked out of the water to eat his dry. He set the hook as the fish swirled and immediately throw the hook. In a cynical laugh Noah cursed the fish. I back rowed the long slow run because we had gotten a few takes through this stretch and wanted to let the run settle before another go. As we came down the run to where Noah had hooked his bigger fish he again put a drift next to the bush. Again a large nose poked out of the water and gulped down his fly. Again he set the hook, this time it came tight. “It’s the same fish!” he exclaimed at which point the fish jumped at the fly came lose. Again! “Yup same fish” Rick and I chuckled. Noah was less than amused because it would have been the fish of the day for sure. Noah drifting dry flies to technical fish. That night I was awaked by murmurs, cursing, and screams from Noah that seemed to be related to that fish and I am willing to bet that Noah is still having nightmares about that fish. 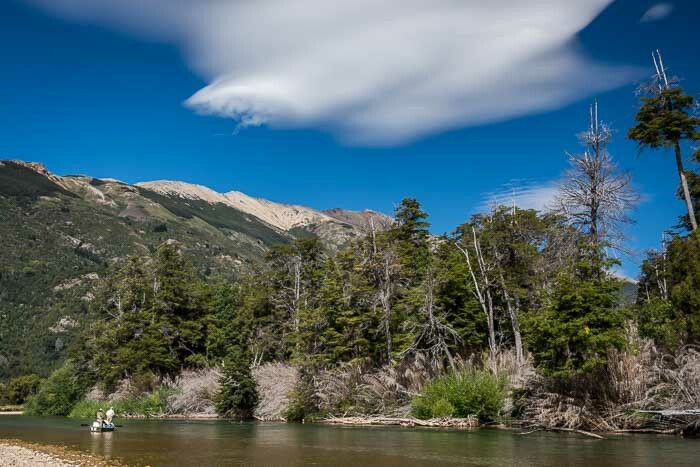 We had hoped for some cloud cover and rain for our 2nd day on the Rivadavia but the sun shined bright and kept the clouds away. The bright sun gave us an amazing view into the underwater view of the river but not so amazing fishing. 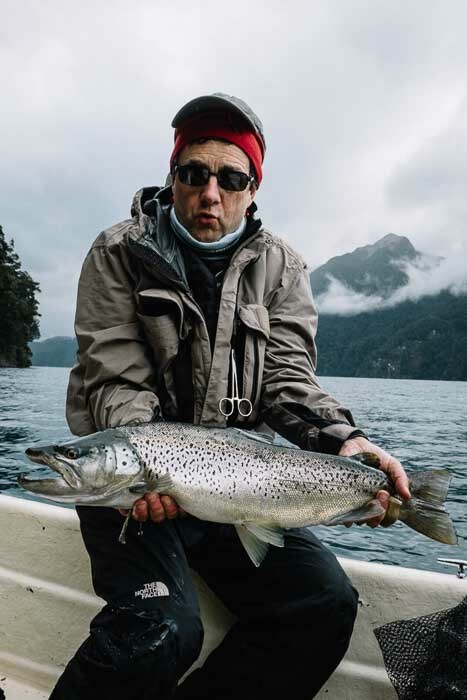 We could see plenty of fish and big fish but getting them to eat our flies was another story. A story that was very short. No thanks! It is days like this that make you really appreciate the days that the rivers or lakes and fish cooperate. It was a gorgeous day for a float down a picturesque river with great friends. So we practiced honing our skills of casting and getting the best drifts we could. By days end we managed a few fish each so when it was all over it was a success. 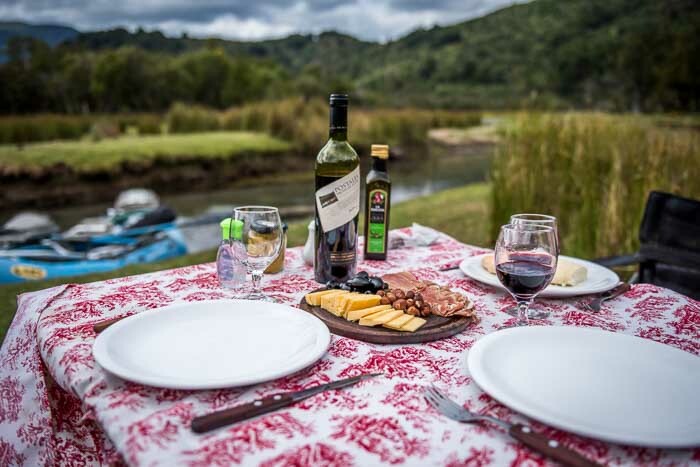 Each day wasn't complete without a very civilized shore lunch. We buzzed across the lake in Marcelo’s Carolina Skiff at a slightly faster pace this day. The wind was calm and the water was smooth. Again I marveled at the size of the lake and the lack of other people around because this time I knew what to expected. Big angry aggressive fish, and plenty of them. 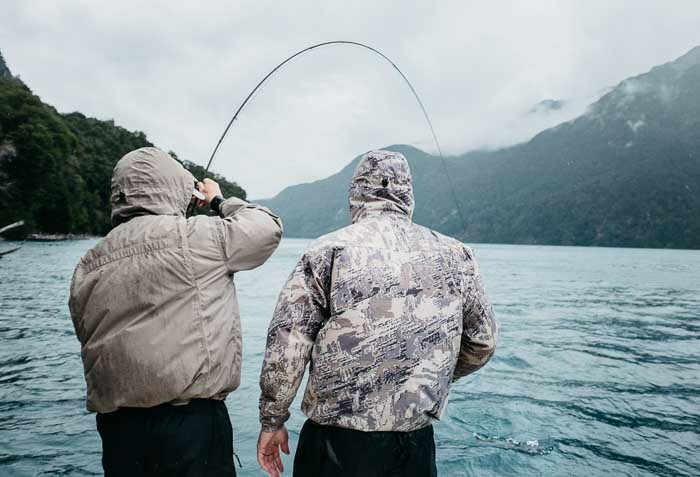 The program was the same, working the juicy banks with sinking lines and streamers. My kind of program! It was like we never left. Fishing chasing, darting and smashing our flies with reckless abandon. We didn’t even notice how hard it was raining because the fishing was on and I mean on “11”. The fast action streamer fishing continued as we all took turns rotating from fishing the front of the boat or back and heckling each other from the peanut gallery. One of the most aggressive fish I have ever encountered! I was stripping one of Marcelo’s custom tied streamers off the bank when a flash of silver streaked out and smashed it. It immediately took to the air, thrashing its head causing my line to shake so violently that the hook shook lose. I instinctively let it go into a back cast to throw it back down to recover and make another cast. But as soon as my fly hit the water again the fish, who was still swirling near the surface, turned and rushed my streamer again. I could hardly react fast enough to get the hook set again but managed to come tight. This time the hook held true and I landed to single most aggressive fish I had ever caught. A sweet 22” rainbow. I try not to use the word epic but this was an epic day and the fishing was still hot. Not but an hour later after a few more rotations through the peanut gallery I cast a large white streamer towards a pile of submerged logs toppled over on one another. I let the fly sink and started stripping. Out from the logs a large dark shadow appeared, not fast but with a purpose. I knew this was a bigger fish and the one I had been looking for. Without hesitation he ate my fly and turned setting the hook. The rod doubled over as the fish fought to get to the depths. Thankfully it wasn’t anything the 15lb tippet couldn’t handle. We battled for a short time until I was able to get him close enough for Marcelo to net. We taped this big beautiful brown at 27”. YEAH! What a day! That was it for me, I was confined to the peanut gallery for the rest of the day. Rick with another monster lake Brown! It was the bottom of the ninth and time to call it a day when Rick started to reel up. With a few choice words I convinced him to make a few more casts and push through he pain in his shoulder and arm from casting a sinking line and streamer all day to only then hook and catch more large trout then we could count. It was his 3rd cast when a fish blasted his streamer and the line came tight. The only words Rick could manage were “oh god” as the fish went for the deep water under the boat. The way his rod was bent it looked like he was on the ocean and fighting a large tuna. After a fair bit of time and not seeing the fish because it was not giving and ground Rick got a second wind and was able to put some much needed pressure on this fish. The fish finally succumbed and Marcelo netted him gently. Another trophy brown trout taped at 28”! Not a bad way to end one of the most amazing fishing days I’ve ever had the pleasure of taking part in. A bittersweet goodbye was made to Marcelo knowing that he had shown us 2 amazing days of fishing but it was hard to say when we would be back, but we would be back. 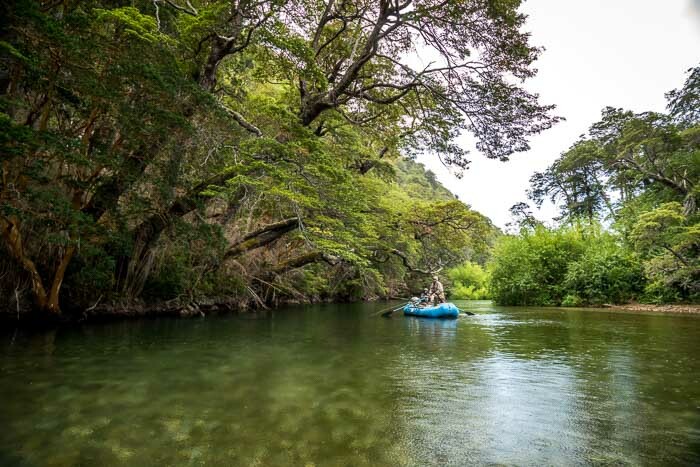 On the short drive to the put in below Lago Cholila we traced the path of the river catching glimpses of emerald green runs and soft riffles that screamed of fishy water. As we rounded the last bend and pulled onto a small gravel bar within sight of the lake we could hardly believe it. There at the put in was another boat. GASP! One other boat. Pancho and Juancho seemed less than thrilled and to be honest we were a little surprised too. This was the last day of fishing for our 2 week journey and we had seen basically no other fishermen. It turned out they knew one of the other gentlemen preparing to launch so the tension quickly transferred to friendly trash talking and hearty laughs. Noah wade fishing the upper Carrileufu. As they readied the boats we wade fished the run leaving the lake with a few takes but no fish landed. Pancho said that with the right weather this run has one of the most prolific midge hatches he has ever seen or heard of. The surface of the water turns black with the tiny bugs he told us. Unfortunately today was cloudless blue skies and very warm, so we would not be lucky enough to witness this hatch. 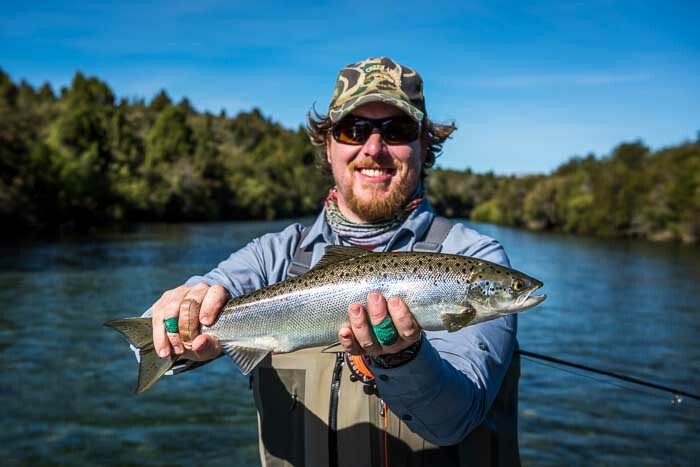 For us that day it would be a bit of dry-dropper action and plenty of streamers pulled low and slow through the deep emerald green water. It was a nice mix of floating and wade fishing shelves and runs here and there with just enough action to keep us on our toes. With the bright sun the fishing was definitely on the technical side but we were up for the challenge. The fish we fooled were healthy and strong. The highlight of the day was for sure the land locked Salmon. Noah with a nice land locked Salmon. These fish are a ton of fun to hook. They are solid, hard fighting fish that don’t give in. They bend a 6 weight rod like a fish twice their size and on this day they were on the bite. Pancho was over the top excited about how many and the size of a few of these salmon. It is generally a rarity to catch more than one or two of these silver torpedo, but we were into the double digits. Rick had the hot hand for them and paid the price with a sore wrist and cramped forearm from battling these beasts. Floating the upper Carrileufu River just upstream from the lodge. The day ended with beautiful light and the perfect temperature for sipping a beer in the back of the boat watching the last bit of river flow by, a very satisfying end to one of the greatest trips I’ve had the pleasure of taking. A huge thanks to Pancho at Carrileufu River Lodge for your team and fantastic hospitality! 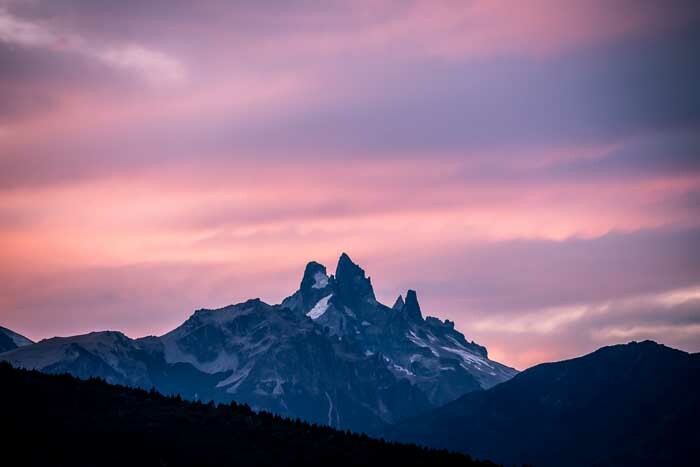 The nightly sunset view from the lodge.